Here is something that might be of interest for people that are considering using stereoscopic 3D as a tool in the classroom in order to be able to better keep the attention of the students, right in time for the beginning of the school year. 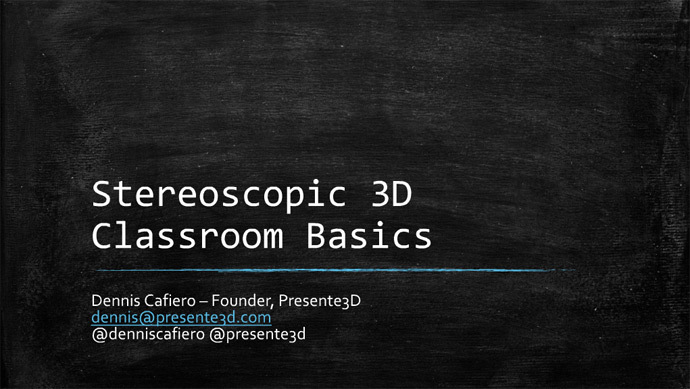 The SIG3D Stereoscopic 3D Classroom Basics webinar took place a few days ago and a recording is now available online if you’ve missed the live one, so you can take a look and later today there will be a Q&A session. The presentation was held by Dennis Cafiero who is also the creator of Presente3D (a tool for making stereoscopic 3D presentations) and in it he makes a brief introduction on how 3D works as well as covering various 3D technologies for the classroom including anaglyph 3D, active and passive 3D stereoscopic solutions as well as glasses-free options (autostereoscopic 3D) with their pros and cons. SIG3D is an ISTE Special Interest Group for educators and innovators interested in stereoscopic 3D and is a part of the International Society for Technology in Education (ISTE).